After the 4th round I had caught myself at the thought that I didn't know who the leader in Krasnoyarsk was. A funny feeling for a commentator. You study the creative aspects so carefully that you pay no attention to the intermediate sportive results. So I suggest that the reader also forgets about points and places, tournament table and superfinal, favorites and outsiders, the more so because there is much to look at in Krasnoyarsk now – the start of the competition has not been disappointing at all. The drawn games are often as spectacular as the ones won by one of the parties, but, for the well-known reasons, remain somewhat in the shadow. I will try to eliminate this injustice – there are fascinating games in this survey that have been drawn. So what games and episodes were the most impressive and interesting? Vladimir Malakhov proposed his own answer to a question "how to fight against the Cheliabinsk monster?" He had managed to somewhat imperceptibly "seize his opponent up", and afterwards it was really difficult to escape this strong positional grip. 3.d4. Psychological struggle began immediately after the clock had been started. With his first move Vladimir Malakhov prevents 1.e4 d6 2.d4 ¤f6 3.¤c3 e5, and with his third one he demonstrates his preparedness for the Main Line Cheliabinsk Variation, though previously he has preferred a tough 3.Ґb5. 3...cxd4 4.¤xd4 ¤f6 5.¤c3 e5 6.¤db5 d6 7.Ґg5 a6 8.¤a3 b5 9.¤d5 Ґe7 10.Ґxf6 Ґxf6 11.c4!? Who will doubt Vladimir's adherence to "his own theory"! He avoids the hackneyed 11.c3 0-0 12.¤c2 Ґg5 13.a4 etc. in favor of a much less studied continuation. 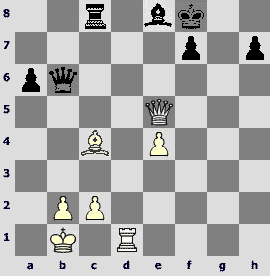 11...b4 12.¤c2 a5.During the analogous last year competition (Tomsk 2006) Maletin chose 12...¦b8 against Yemelin and lost. 12...a5 looks more natural. 13.g3! Just the idea that has revived the interest in 11.c4 lately. If the bishop is developed to e2 or d3 Black has not even a shadow of a problem. 13...O-O 14.h4! ?Restricting the f6-bishop. On 14.Ґg2 Black could have played 14...Ґg5! 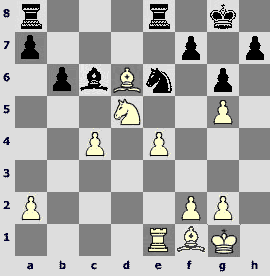 15.0-0 ¤e7=, as it happened in the game Balogh– Moiseenko, Moscow 2006. 14...Ґe6 15.Ґh3 ¤d4. On 15...Ґe7 there is a profound 16.Ґg2! This is not a loss of a tempo, because the bishop on e7 stands badly depriving the c6-knight of a square. White's advantage in this ramification was confirmed by two games between Predojevic and Wang Yue, in which there followed ...Јb8 17.¤ce3 ¦c8 18.0-0 ¦a7 19.Јd3 Ґd8 20.¦ad1 ¤d4 21.ўh2 Јb7 22.f4!І (Lausanne 2006) and 17...Ґxd5 17.¤xd5 Ґd8 18.0-0 Ґb6 19.Ґh3 ¦a7 20.Јh5І (Moscow 2007). 16.¤xd4 exd4. 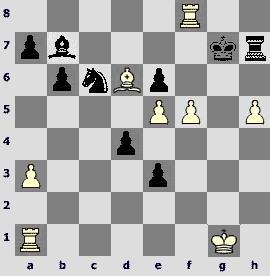 So far the opponents follow the game Svidler – Eljanov, Germany 2006, in which Black drew confidently. 17.Ґxe6! Vladimir makes Peter's play more precise (Svidler chose 17.Јd3). Surely this square is intended for the knight, which is generally known as the "best blocker". 17...fxe6 18.¤f4 Јe7 19.Јg4. Now the pressure upon the e6-square is created. It seems superfluous to remind of the e6-e5 advance's drawbacks. 19...¦ae8?!N. A novel and probably not the best way of positioning the rooks. Previously in Zelcic – Saric, Pula 2006,there followed 19...¦ac8 20.¦c1 d3!? 21.¤xd3 Ґd4 22.O-O ¦f6. This is interesting, but, to my mind, the reality of the compensation for a pawn can be called in question. 20.O-O Јf7.Pavel intends to move his bishop to the Q-side, but this piece is not destined to show its worth in this game. White knight is much stronger in this pawn structure. 21.¦ac1. When the opportunity presents itself, one can think of c4-c5. 21...Ґd8 22.h5! This pawn is to play an important part in the game. 22...Ґb6 23.ўg2. There's no need to hurry. After 23.¤d3 one should reckon with 23...Јf3 24.Јxf3 ¦xf3 25.¤f4 ¦f8 26.ўg2 ¦3xf4 27.gxf4 ¦xf4 28.f3, and although White is an exchange up, Black can still hope for a drawn fortress. 24...Јe7? Either this is a decisive mistake or such has been made somewhere earlier. Black should not permit f2-f4. He should have played 24...e5 25.¦ce1 (or 25.f4 exf4 26.¦xf4 Јe6) 25...Јh6, for good or ill, so that the move f2-f4 would lead to opening up and somewhat sharper play. 25.f4! Now White's position is strategically won, and that's no overstatement. 25...Ґc5. On 25...e5 there follows 26.f5, after which White is guaranteed a breakthrough on a flank. 26.e5! 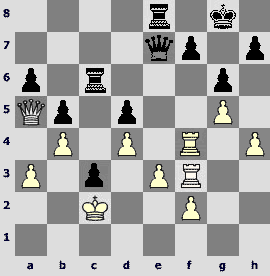 White's plan is simple: to step up the pressure along the e-file and to enforce the exchange on e5 on his opponent. 30.fxe5! A classic way. Malakhov aims at acquiring the "queen + knight" tandem. Not that 30.¤xe5 looks bad. 30...¦xf1. On 30...Јb7+ one can calculate 31.ўg1 ¦xf1+ 32.ўxf1 Јh1+ 33.ўe2 Јg2+ 34.ўd1 Јf1+ 35.ўc2 ўh8 36.¤xc5 Јxc4+ 37.ўd2 Јxc5 38.Јxe6 h6 39.ўd3ќ, but there is also a solid 31.¦f3!? ¦xf3 32.Јxf3 Јc8 (all the rest loses more rapidly) 33.Јg4 – positional advantage is really great, and White's victory is beyond any doubt as well. 31.ўxf1 Ґb6.No better is 31...Ґa7 32.h6 g6 33.ўe2ќor 31...ўf7 32.Јf3+ ўg8 33.Јa8+ќ. 33.c5! Black loses the d4-pawn along with the whole game. 33...Ґc7. Hopeless is 33...Ґxc5 34.¤xc5 Јxc5 35.Јxe6+ ўf8 36.Јf6+ ўe8 37.Јh8+ќ. Artyom Timofeev's positional masterpiece can be a rival of the previous game in the nomination "A clean sweep without splash". 1.d4 d5 2.c4 e6 3.¤c3 c6 4.e3 ¤f6 5.¤f3 ¤bd7 6.Јc2 Ґd6 7.g4 Ґb4 8.Ґd2 Јe7 9.¦g1 Ґxc3 10.Ґxc3 ¤e4 11.O-O-O ¤xc3 12.Јxc3 O-O 13.cxd5 exd5 14.g5?!N. Not the best novelty. As shows the following course of the game, White has no right to permit the c6-pawn advance to c4-square, and after the exchange on c5 the weakening of the f5-square will tell. More logical is 14.Ґd3. 14...c5! 15.Ґd3? And still White should have played 15.dxc5 ¤xc5 16.Јe5 in hope for leveling. White continues with his incorrect plan. 15...c4! The center being static, Black's play on the Q-side clearly develops more rapidly. 16.Ґb1 b5 17.Јa5. You don't make such moves if everything is all right. To block the way of enemy pawns is a thankless task for a queen. 17...¦b8! The a7-pawn does not count, of course. 18.¦g4 Јd6 19.¦h4 g6 20.¦f4 a6. On 20...b4 the reply was in stock 21.¤e5. 21.b4?! A funny move. White builds his defensive redoubts at the cost of immuring his own queen and giving his opponent a present of a protected passed pawn. 21...¤b6 22.¤e5 Ґe6 23.Ґc2 ¦fc8 24.¦f6 ¤d7! Artyom Timofeev precisely calculated all the consequences of taking on f7. 25.¤xd7. After 25.¤xf7 Јe7 26.¤h6+ ўg7 27.¦f3 Јxg5 28.¤f5+ (28.Ґf5 ¦f8 29.¦g3 ¦xf5 30.¦xg5 ¦xg5 31.Јxa6 ¦b6 32.Јa7 ўxh6) 28...Ґxf5 29.Ґxf5 Јh5! 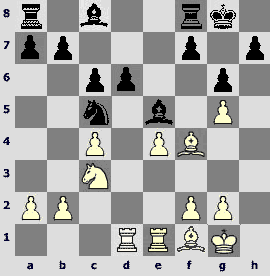 30.Ґxd7 Јxf3 31.Ґxc8 ¦xc8 32.Јxa6 ¦f8 33.Јe6 Јxf2° White is helpless. 28...Ґg4! An efficient maneuver. The best white piece is the c2-bishop, so it has to be exchanged. 29.¦g1. More stubborn is prophylactic 29.¦e1. 29...Ґe2! 30.ўd2 Ґd3! 31.¦g3. White cannot permit the opening of the c-file. In case of 31.Ґxd3 cxd3 32.ўxd3 ¦ec8 33.ўe2 (33.¦d1 ¦c2 34.¦d2 ¦8c3+ 35.ўe2 Јc8) 33...¦c2+ 34.ўf3 Јh3+ 35.¦g3 the issue is decided by problem-like 35...¦xf2+! 36.ўxf2 Јh1!°. 31...Ґxc2 32.ўxc2 c3! The pawn has made another step forward, and black queen puts in a claim for the now vacant c4-square. 33.¦gf3 Јe7 34.a3. On 34.¦xf7 there is a elegant win 34...Јe4+ 35.ўc1 Јd3! 36.¦f8+ ¦xf8 37.¦xf8+ ўg7! 38.¦g8+ ўf7! 39.¦f8+ ўe6! 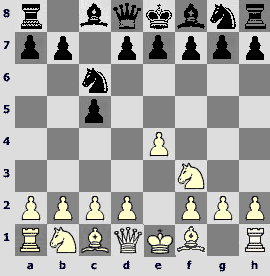 40.¦e8+ (40.¦f6+ ўe7) 40...ўf5°, and the Black king hides itself in the enemy's rear. 34...¦f8! Now the f7-square is protected, so Black can fortify his queen's position. 35.¦g3 Јe6 36.a4 Јc8! 37.¦gf3?! Aggravating the already grave situation. No better than the move in the game is 37.axb5 axb5 38.Јxb5 Јa8! 39.Јxd5 Јa4+°. The only way to keep up the resistance is 37.¦g1! ¦d6 38.axb5 Јc4 39.¦e1, preventing the queen's invasion. 37...¦d6! It's all over. The white king is under decisive attack. 38.e4.If 38.axb5, then 38...Јc4 39.Јa1 Јe2+ 40.ўb3 axb5 41.¦f6 ¦d7! 42.h5 ¦a7!°. Konstantin Sakaev's opening idea attracted attention. In the similar situation they used to sacrifice an exchange before, but this does not diminish the aesthetic impression. 1.d4 ¤f6 2.c4 g6 3.¤c3 Ґg7 4.e4 O-O 5.¤f3 d6 6.Ґe2 e5 7.O-O ¤a6.This branch of the King's Indian Defense is not devoid of actuality. In this particular game the opponents followed a theoretically well-known variation in which the game is rapidly transposed into an ending. 16.Ґh2!?N. Konstantin is the first to surprise his opponent. In case of the most popular 16.g3 the Black's best reaction would be 16...b6!, and if 17.¦xd6 Ґxd6 18.Ґxd6, then 18...¦d8„. After 16.Ґh2 Black has to reckon with 17.f4. 16...¦e8. 16...b6 17.f4 Ґxc3 18.bxc3 ¦d8 (18...¦e8 19.¦xd6 ¦xe4 20.¦xe4 ¤xe4 21.¦d8+ ўg7 22.Ґd3±) 19.¦d4 Ґe6 20.Ґe2 ¦e8 21.g4І is in White's favor. 17.¦xd6! A standard positional exchange sacrifice. 17...Ґxd6 18.Ґxd6 b6 19.b4!? White is not in a hurry to advance his d-pawn preferring to take the d5-square under his control. 19...¤e6 20.b5 Ґb7. Black should have thought about giving back the material somehow and neutralizing the opponent's activity. From this point of view 20...cxb5!? 21.¤d5 ¦d8 22.Ґe7 Ґb7! 23.Ґxd8 ¦xd8 is worth attention. 22...Ґxd5? A serious blunder. Black on his own free will creates powerful central pawns for White. Stronger is 22...¤xg5! 23.e5 (on 23.¤f6+ ўg7 24.¤xe8+ ¦xe8 25.f3 there is 25...f5! with an idea of 26.e5 Ґxf3!) 23...ўg7 24.¤c7 ¤e4 with chances for equalization. 23.cxd5. Now White's advantage is obvious. 23...¤xg5. It's a dangerous square for the knight. It is fated to perish here. If 23...¤d4, then 24.f3 ¦ad8 (24...¦ac8 25.¦d1) 25.Ґg3! (25.Ґf4? ¦xd5) 25...¦c8 26.¦d1 ¤c2 27.Ґb5 ¦ed8 28.Ґe5±. 24.e5 ¦ad8. Hopeless are 24...h5 25.Ґb5ќor 24...f6 25.e6 ¦ad8 (25...¦ed8 26.Ґc7 ¦xd5 27.e7) 26.Ґb5ќ. 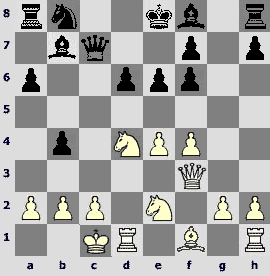 More stubborn is 24...f5!, providing the knight with a stand in the center, but even then White wins by way of 25.e6! ¤e4 26.Ґc7 ўf8 27.Ґb5 ¦e7 (27...ўe7 28.Ґxe8 ¦xe8 29.f3 ¦c8 30.Ґf4 ¤d6 31.ўf2) 28.d6! ¦xe6 29.Ґc6 ¦ae8 (29...¦c8 30.d7) 30.Ґxe4 ¦xe4 31.¦xe4 ¦xe4 32.d7ќ. 25.f4! The knight is caught, and any further resistance is hopeless. The following game is a continuation of the subject. Here we have a positional sacrifice of an exchange again, but converting the advantage has been much more difficult for Evgeniy Najer. 1.e4 c6 2.d4 d5 3.e5 c5 4.dxc5 ¤c6 5.Ґb5 e6 6.Ґe3 ¤ge7 7.c3 Ґd7 8.Ґxc6 Ґxc6 9.¤f3 ¤f5 10.Ґd4 ¤xd4 11.Јxd4 a5. For some reason Black agrees to a well-known variation that is not in high favor with theory. 17.axb4!? Evgeniy prefers a sacrifice of an exchange, although there is another recommendation – for the materialists: 17.¤c3 ¦xa3 18.b7! Јxb7 (18...Ґxb7? 19.¤b5) 19.¦ab1 Ґxc3 20.¦xb7 Ґxd4 21.¦b8+ ўe7 22.¦xh8. 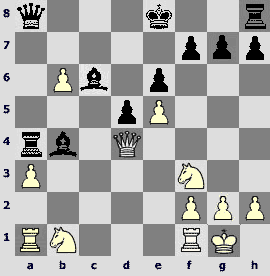 A pair of bishops and a passed pawn in the center give Black certain chances for a draw. 17...¦xa1 18.Јc5. White has a far-advanced passed pawn, black king is stuck in the center – all those factors are more than enough compensation for insignificant material losses. 18...Ґb7N. 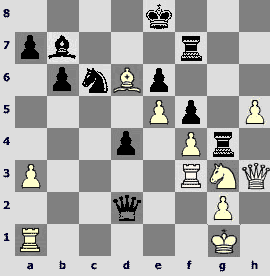 The game Areshchenko – Khenkin, Eppingen 2006 ended quickly and sadly for Black: 18...f6?! 19.¤d4 Ґd7 20.exf6 gxf6 21.Јd6 Јc8 22.¤f5! exf5 23.Јxf6 1-0. Along with the move in the game, 18...Ґd7!? also needs studying. 19.¦c1 Јd8. 19...Јa2 loses in view of 20.¤fd2! 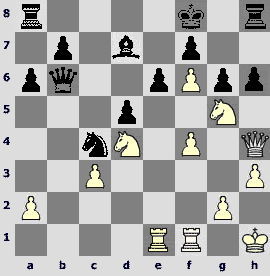 (20.Јd6 Јxb1 21.Јb8+ ўe7 22.Јxb7+= leads only to a draw) 20...Јb2 21.Јb5+! 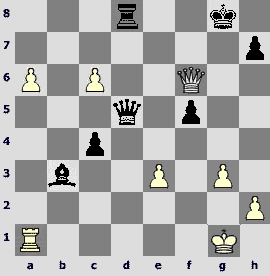 (preventing kingside castling) 21...ўd8 22.Јc5 Јxe5 (22...ўe8 23.Јc7!) 23.¤f3 Јf4 (23...Јb8 24.Јd4) 24.g3 Јb8 25.Јd4ќ. 20.¤d4 Јe7. If 20...¦a6? !, then 21.¤b5. 21.¤b3! The knight goes to c5 in order to support the passed b-pawn. 21...Јxc5 22.¤xc5! One should not strive for connected passed pawns always. Weaker is 22.bxc5?! ¦a6! 23.c6 Ґxc6 (23...¦xb6? 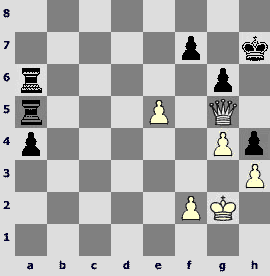 24.cxb7 ¦xb3 25.¤d2ќ) 24.¦xc6 O-O, and the b6-pawn falls. 22...Ґc8. Bad is 22...Ґc6? 23.¤b3ќ. 23.b7 Ґxb7 24.¤xb7. White already has material advantage, but situation with two knights against rook always presupposes considerable difficulties in converting. 24...O-O. 24...ўe7!? has its swings and roundabouts. 25.¤c5. White's main problem is the pin along the first rank. In order to get rid of it Evgeniy Najer returns his knight to d3. Premature is 25.b5?! ¦b8 26.¤d6 g5! 29.h4?! White's desire to fortify his position as much as possible is understandable, but meanwhile he misses a fine opportunity. After 29.¤c3! ¦xc1+ 30.¤xc1 White should win. The further possibilities are: 30...¦c8 31.¤3e2 d4 32.ўf2 ¦c2 33.ўf3 ўf7 34.¤d3 ¦d2 35.¤ec1ќor 30...¦f4 31.¤3a2! (an important resource) 31...¦d4 (31...¦e4 32.¤d3) 32.¤b3 ¦e4 33.b5 ¦xe5 34.b6 d4 35.b7 ¦b5 36.¤a5!ќ. In the final position of the latter variation white king renders harmless the black central pawns, and the knight from a2 inevitably comes to c5 ensuring victory. 29...h6 30.¦d1 ¦c8! Black impedes 31.¤c3 and makes White's task more difficult. 31.ўf2 ¦c4 32.g3 g5 33.h5 ўf7 34.ўe2?! Should Black get to the g3-pawn, than he obtains real counterplay. Better is 34.¦f1 with an idea of 35.¤d2. 40...¦b2? Looks like a decisive mistake. Black grabs the wrong pawn. While struggling against two knights it was not worth it to agree to a static position with pawns on the same flank. Double-edged 40...¦xg3! promises good drawing chances. For example, quite harmless is straightforward 41.b5?! g4 42.b6 ¦g1+ 43.ўc2 ¦xb1! 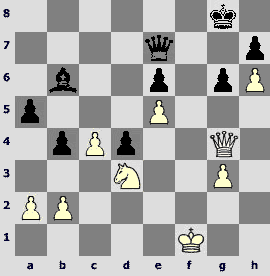 44.ўxb1 g3 45.b7 g2 46.b8Ј g1Ј+ 47.ўc2 Јxc5= – it is White who has to make a draw now. 41.¤c3 ¦xb4 42.ўc2. The c4-pawn is not long for this world. There is nothing else left for Black but passively watch his situation getting worse and worse. In the technical stage Najer was irreproachable. 62.¤g8+! ўf7 63.¤xh6+ ўg7 64.¤f5+! A simple but effective solution. 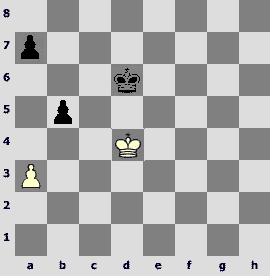 In the ending Black is helpless against connected passed pawns. Now let us switch over to flashing attacks and crushing defeats. Farrukh Amonatov's victory against a formidable opponent is formally no miniature, but in fact everything had been decided long before the players signed the scoresheets. 1.e4 c5 2.¤f3 ¤c6 3.d4 cxd4 4.¤xd4 ¤f6 5.¤c3 d6 6.Ґc4 e6 7.Ґe3 Ґe7 8.Јe2 ¤xd4 9.Ґxd4 a6 10.O-O-O b5 11.Ґb3 Ґb7. In reply to the Velimirovic Attack Вlack chooses a not-so-common development plan which has been successfully employed by Alexey Dreev lately. 13...Јb8!?N. In Mihalcisin – Petrushin, Daugavpils 1978, there was 13...Јa5. Malakhov leaves the a5-square vacant as it may come in handy for the pawn, but soon loses an opportunity to benefit from his own idea. 14.f5. I am not sure that this most aggressive continuation is best one. It is not necessary to determine the pawn structure immediately. Both14.g4!? and 14.ўb1!? are worth attention. 14...e5 15.Ґf2 Ґc6? One just cannot procrastinate in such a situation. And it was an ideal moment for 15...a5! This is not even a sacrifice as white central pawn hangs. After 16.¤d5 ¤xd5 17.Ґxd5 b4 Black has quite an acceptable play. 16.g4. There is a threat of 17.g5, and Black has already no time for thinking of the accessory advance a6-a5. 16...b4. On 16...Јb7 there is an interesting reply 17.¦de1!? with the following g4-g5. 17.axb4 Јxb4 18.¦he1 ¤d7 19.h4! More precise than 19.Ґd5 Ґg5+ 20.Ґe3 Ґxe3+ 21.Јxe3 ¤b6! (22.Ґxc6? ¤c4). White combines the pawn storm with constricting his opponent's dark-squared bishop. 19...¤c5? 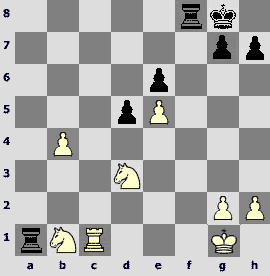 Less than twenty moves have been made, but the decisive white advantage can already be certified. 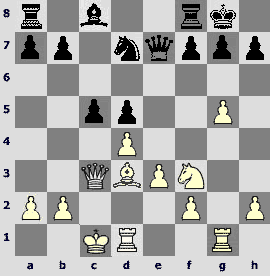 In view of the further exchange of the bishop for the knight, the move 19...¤c5? is disastrous for Black, as it deprives him of any hope for counterplay. What to suggest instead? In case of 19...a5?! there follows 20.Ґd5! White seizes the d5-square and continues his attack unhindered, for instance: 20...Јb7 21.g5 ¦fb8 22.Ґxc6 Јxc6 23.f6 gxf6 24.¤d5 Ґd8 25.gxf6 ¤xf6 (25...Ґxf6 26.Јf3!ќ) 26.¦g1+ ўf8 (26...ўh8 27.Јf3! ¤xd5 28.Јxf7ќ) 27.Јe3 ¤xd5 28.Јh6+ ўe8 29.¦xd5 Ґe7 30.Јxh7ќ. The best chance is prophylactic 19...¦ab8! 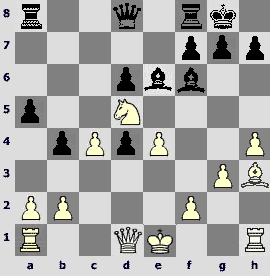 A tactical novelty can be seen in the variation 20.Јxa6 ¤c5! 21.Јxc6? ¤xb3+ 22.cxb3 ¦fc8 23.Јa4 ¦xc3+! with black advantage. On 20.g5 there follows 20...a5 (21.g6?! a4!). White's chances are still better, but at least the struggle becomes sharper. 20.Ґxc5! On 20.Ґd5?! thereis 20...¤a4! 20...dxc5.To take with queen is no better. 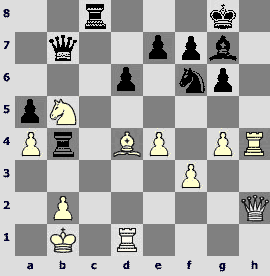 21.g5 Ґb5 22.Јh5 c4.Black manages to neutralize the white bishop for the time being, but it's cold comfort. 23.¤d5 Јc5 24.f6! Ґd8 25.Ґa2 ¦e8 26.fxg7 ¦e6. If 26...ўxg7, then 27.¦f1 ¦a7 28.¦f6ќ. 27.¦f1 Ґe8. By way of 27...¦a7 Black can only prolong his agony for a while. 28.g6! It's already impossible to stop Farrukh! 28...¦xg6 (28...hxg6 29.Јh8#; 28...fxg6 29.Јh6 Ґf7 30.¦xf7 ўxf7 31.Јxh7ќ) 29.Јxe5 Јc6 30.Ґxc4! The bishop is back, and everything becomes clear once and for all. White could have won more quickly subsequently, but this is not a matter of principle. 31.¤e7+ Ґxe7 32.Јxe7 ¦xg7 33.¦g1. More spectacular is 33.¦xf7! ¦xf7 (33...Ґxf7 34.¦d8+ ¦xd8 35.Јxd8+ Јe8 36.Јxe8#) 34.¦g1+ Јg6 (34...ўh8 35.Јe5+ Јf6 36.Јxf6+ ¦xf6 37.¦g8#) 35.¦xg6+ hxg6 36.e5ќ. 33...Јb6. 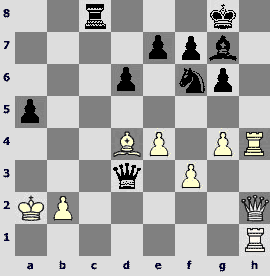 If 33...Јxc4, then 34.¦xg7+ ўxg7 35.¦g1+ќ, and mate is given with the next move. 34.¦xg7+ ўxg7 35.ўb1 ¦c8 36.Јe5+ ўf8. Or 36...ўg8 37.¦f1! 37.Ґb3. It is easy to see that the blow on f7 would have worked here as well – 37.Ґxf7! Ґxf7 (37...ўxf7 38.Јf5+) 38.Јh8+ Ґg8 39.¦f1+ ўe7 40.Јg7+ќ. 37...Јg6 (37...¦d8 38.Јh8+ ўe7 39.¦f1ќ) 38.Јh8+ ўe7 39.Јd4 a5 40.e5 Јc6 41.Јh4+ ўf8 42.e6! Sweeping off the last remnants of the royal residence. 42...fxe6 43.¦f1+ Ґf7 44.Јxh7 ¦c7 45.Јh8+ ўe7 46.Јh4+ ўf8 47.Јd8+ ўg7 48.Јf6+ ўf8 49.Ґa4! Јg2 (49...Јxa4 50.Јd8+ќ) 50.Јd8+. Another way is 50.Јh8+! ўe7 (50...Јg8 51.Јh2) 51.¦d1 Ґg8 (51...Јg8 52.Јh4+) 52.Јh4+ ўf7 53.Јf4+ќ. Boris Savchenko won a fine game with special effects. For justice sake I must notice that he ought to thank his opponent for cooperation. 1.e4 c5 2.¤f3 e6 3.d4 cxd4 4.¤xd4 a6 5.¤c3 Јc7 6.Ґd3 ¤c6 7.Ґe3 ¤f6 8.O-O Ґd6 9.h3 Ґf4 10.Јc1 Ґxe3 11.Јxe3 ¤e5?!N. 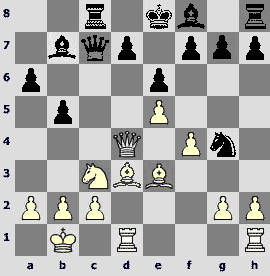 Main continuations here are 11...Јb6 and 11...d6. Losing tempi on the knight's leaps Black lags greatly in development and exposes himself to unnecessary risks. 13.e5! Exclamation sign for a brave decision in such an important competition. It is clear that simple 13.cxd3 permitted White to retain his advantage, but Boris wants to punish his opponent for his defiant opening play immediately. White obtains strongest initiative but has to play accurately in order to prove that he has enough compensation for his two sacrificed pawns. 13...¤xb2. Totally bad is 13...¤c5? 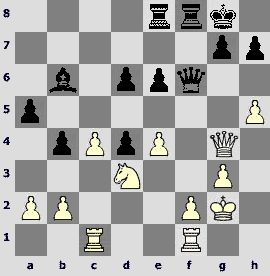 14.exf6 gxf6 15.b4!ќ, and after 13...¤b4 14.exf6 gxf6 15.a3 ¤c6 16.¤d5 Јd8 17.¤f5ќ White creates decisive threats. 14.exf6 g6. In case of 14...gxf6?! 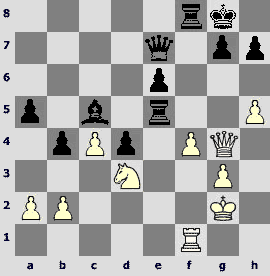 15.¤d5 Јd8 16.¤f5 ¤c4 17.Јg3ќ White develops his attack unhindered. Castling looks no less dangerous: 14...O-O?! 15.fxg7 ўxg7 16.¤e4 ¤c4 17.Јg3+ ўh8 18.Јh4±. 15.¦ae1 ¤c4 16.Јf2 Јa5! Black seems to find a correct plan and prepares to evacuate his king on the Q-flank, but at the very last moment abandons his idea. To go to the "native" side is risky: 16...O-O 17.Јh4 Јc5 (17...ўh8? 18.Јh6 ¦g8 19.¤e4ќ loses at once) 18.f5! 17.¤e4 d5! 18.¤g5 Јb6! Correctly fearing a possible sacrifice on e6. 19.c3! 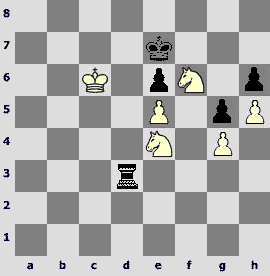 Having defended the knight, White releases his queen. 19...Ґd7 20.ўh1 h6 21.Јh4 ўf8? A blunder. After 21...¦f8! 22.Јxh6 O-O-O Black could feel comfortable enough. Now his position collapses. 22.f5! White opens up lines and quickly gets at the black king. 22...gxf5. 22...e5 23.fxg6 fxg6 24.f7! (threatening with 25.¤ge6+ Ґxe6 26.Јf6!) 24...exd4 25.¤h7+ ўg7 26.f8Ј+ ¦hxf8 27.Јe7+ќ does not save Black as well. 23.Јh5 ¤d6 24.¤xf5! Not the only continuation, but the most attractive one. Viacheslav Zakhartsov had efficiently neutralized the Russia ex-champion's initiative. The opponents seemed to approach a peaceful haven steadily... But sometimes the fortune makes presents. 1.e4 c5 2.¤c3 ¤c6 3.¤ge2 e6 4.d4 cxd4 5.¤xd4 Јc7 6.f4 ¤xd4 7.Јxd4 a6 8.Ґe3 b5 9.O-O-O Ґb7 10.Ґd3 ¦c8 11.ўb1 ¤f6 12.e5 ¤g4!? More often the knight is retreated to d5, but the leap to g4 is not a bit weaker. 13.Ґe4!?N. A novelty associated with sacrifice of a pawn. Previously there occurred 13.¤e4 Ґxe4 14.Ґxe4 Ґc5 15.Јxc5 Јxc5 16.Ґxc5 ¦xc5, and in Schmaltz – Rudolf,Germany 2004, White failed to gain anything in the opening. 13...Ґxe4 14.¤xe4. After 14.Јxe4?! b4 White loses a pawn in much less advantageous circumstances. 14...¤xe3 15.Јxe3 Јxc2+ 16.ўa1 Ґc5! The only move. Bad is 16...Ґe7? 17.¦c1ќ. 17.¤d6+ ўf8.After 17...Ґxd6? the issue is again decided by 18.¦c1!ќ. 18.Јe1 Ґxd6 19.¦xd6 g6.Trying to keep his extra pawn one can become a target of a strong attack, for example: 19...ўe7 20.¦d2 Јc4 21.Јh4+. Viacheslav aims for more reliable continuations, and Sergey Rublevsky starts to lay it on too thick bit by bit. 20.¦xd7 ўg7. If 20...Јxg2, than 21.Јd1! threatening with 22.¦xf7+. 21.f5!? Wishing to intensify the struggle. White has not overstepped the limits of acceptable risk yet. After 21.Јd1 the game, in all probability, would have ended in a draw and never got within the frameworks of this survey. 21...exf5 22.e6 ¦hf8 23.a3 Јe4! After 23...Јxg2?! 24.Јe5+ ўg8 25.¦e1! every white piece would have become active. 24.Јxe4 fxe4 25.¦e1 ¦cd8 26.¦xe4. In case of 26.¦a7 ¦d4 the only party with some chances is Black. 26...¦xd7 27.exd7 ¦d8 28.¦d4 ўf6 29.¦d6+ ўe5 30.¦xa6 ¦xd7. The ensuing rook ending is, objectively speaking, a drawn one, but due to the black king's activity White has to be careful. 34.a4?A glaring blunder. The incorrect evaluation of the pawn endgame leads to sad results. Correct is 34.ўc3=, preventing the rook's invasion on d2. 34...bxa4+ 35.ўxa4?! Loses instantly, although after 35.¦xa4 ¦d2 Black's victory is not far off as well. 35...¦xa5+ 36.ўxa5 f4. 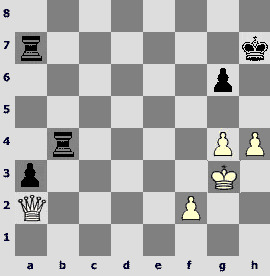 Black wins in the vein of Grigoryev's famous studies. 37.b4. On 37.ўb4 a classic "shoulder charging" decides the issue: 37...ўd4! 38.ўb3 ўd3!°. Well, no sport is interesting without mistakes. Now we have two wins of Denis Khismatullin before us. Let the readers define for themselves which one is more deserved. During the whole game White has got an advantage, and now there is a chance for him to cash in on his connected passed pawns' power. 35.Јe3?! Stronger is 35.a5! ¤d3 36.a6! Black is completely helpless in case of 36...¤xc1 37.Јxc1ќ. Also loses 36...Јc5 37.¦f1 ¦xd5 38.Ґxd5 Јxd5 (38...e3 39.Ґf3 exf2+ 40.ўh1 Јe3 41.Ґg2) 39.b6 ¤c5 (39...¤e5 40.b7) 40.Јa5ќ. If 36...a3, then 37.a7 e2 (37...exf2+ 38.ўg2 ¤xc1 39.Јxc1) 38.¤f6+! (38.a8Ј? ¦xa8 39.Ґxa8 Ґd1) 38...ўf8 39.¤xh7+ ўe7 40.Јd2! ¤xc1 41.Јg5+! f6 42.Јg7+ ўe6 43.Јxf6#. It's the most efficient way to win. 35...ўh8. 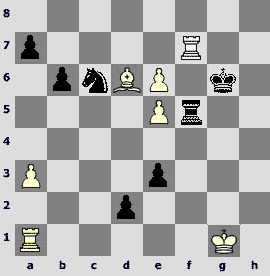 The threat 36.Јg5+ looks terrible, so Black takes some defensive measures. 35...h6 36.a5 ¤d3 37.a6! ¤xc1 38.Јxc1 Јc5 39.Јe3 Јxe3 40.fxe3ќ is no better than the move in the game, but there is a courageous move 35...¤d3! After 36.Јg5+ ўh8 thetempting37.¤f6?! brings no success due to unobvious enough 37...¤xc1 38.Јh6 ¤e2+! (38...Јd1+ 39.ўg2 Јf3+ 40.ўh3) 39.ўg2 ¤f4+! 40.gxf4 ¦g8+! 41.¤xg8 Јd3! Strange as it may seem, I see no win for White here – the open king ant the passed c-pawn limit the possibilities to a great extent. Having vanquished temptation one can find 37.¦a1! ¤e5 38.Јxf5! ¤f3+ (38...¤xc6 39.bxc6 Јxd5 40.c7ќ) 39.ўg2 ¤d4 40.Јh5 (not so clear is 40.Јxf7 c3 or 40.Јf6+ Јxf6 41.¤xf6 c3) 40...f5 41.¤e3± with an extra pawn and fine prospects for the win. 36.Јd4+? And after this move the advantage could have vanished into the thin air once and for all. The rook should have been kept protected. The passed pawns still wait for a command to go ahead: 36.a5! ¤d3 37.a6! c3 (37...¤xc1 38.Јxc1; 37...f4 38.Јd4+ f6 39.¦a1) 38.Јd4+ Јe5 39.Јxe5+ ¤xe5 40.¤xc3ќ. 36...f6 37.a5 ¤d3 38.¦a1.To a drawn ending leads 38.¦c3 ¤b4 39.a6 ¤xc6 40.bxc6 Јxc6 41.¤e7 ¦xd4 42.¤xc6 ¦d1+ 43.ўg2=. 38...¤e5. Threatening with 39...¤f3+. It is possible to pour still more oil on the flames by way of 38...c3!? 39.Јc3! The piece sacrifice is necessary. On 39.Јb6?! ¤xc6 40.Јxc6 there would have followed not 40...Јxc6? 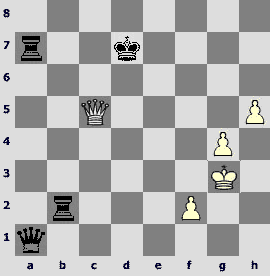 41.bxc6 ¦xd5 42.c7 ¦c5 43.a6 ¦xc7 44.a7 ¦c8 45.a8Ј ¦xa8 46.¦xa8+ ўg7 47.¦c8ќwith a technically won ending for White, but 40...Јe5! 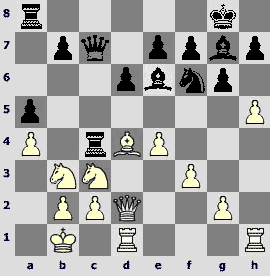 41.Јxf6+ Јxf6 42.¤xf6 c3 – white knight is "offside", and the c3-pawn is extremely dangerous. 39...¤xc6 40.bxc6 Јxd5 41.Јxf6+ ўg8 42.a6. It is very difficult to struggle against passed pawns while your king is weak, but still it is possible, as the analysis shows it. 42...e3!? A correct idea. In order to create counterplay it is necessary to weaken the white king. 43...Ґa4? A decisive miscalculation - and the escape has been already at hand... After 43...¦a8 44.c7 (44.a7 Јe4) it's high time to pitch the bishop into the job: 44...Ґc2! (44...Јd7? 45.Јb6 Ґc2 46.Јb8+ Јc8 47.a7 Ґe4 48.¦a6ќ; 44...Јd2? 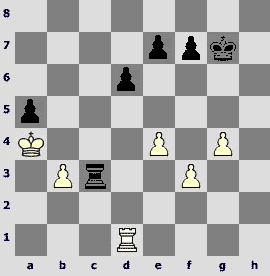 45.Јe6+ ўg7 46.a7ќ) 45.Јb6 (45.a7 Ґe4) 45...Јd2!, and White has to force a perpetual check. 44.Јg5+ ўh8 45.Јf6+ ўg8 46.c7 ¦c8. To a lost queen ending leads 46...¦e8 47.Јg5+ ўh8 48.¦xa4 Јd1+ 49.ўg2 Јxa4 50.Јf6+ ўg8 51.c8Ј ¦xc8 52.Јe6+ ўg7 53.Јxc8 Јc2+ 54.ўh3ќ. 47.Јg5+! 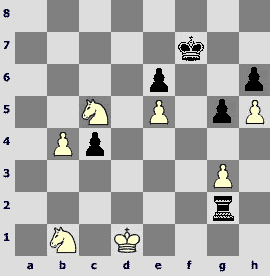 Intermediate check ensures victory for White. 47.¦xa4? Јd1+ 48.ўg2 Јe2+ 49.ўh3 Јg4+=. 47...ўh8 48.¦xa4 ¦xc7. If 48...Јd1+, then49.ўg2 Јe2+ (49...Јxa4 50.Јf6+ ўg8 51.Јe6+ ўg7 52.Јxc8) 50.ўh3 Јf1+ 51.ўh4ќ. 49.Јf6+ ўg8 50.Јd4 Јc6. After 50...Јxd4 51.exd4 ¦a7 52.ўf2 Black can resign as well. 1.e4 c5 2.¤f3 d6 3.d4 cxd4 4.¤xd4 ¤f6 5.¤c3 a6 6.Ґg5 e6 7.f4 Јc7 8.Ґxf6 gxf6 9.Јf3 b5 10.O-O-O. White chooses a not-so-popular, but crafty enough move order. His opponent turns out to be unprepared for this. 10...b4 11.¤ce2 Ґb7? Stronger is 11...¤d7, in order on 12.Јh5 to have 12...¤c5. 12.Јh5! No need to lose time for the excessive defense of the center. After 12.Јh5! Black finds himself a real pickle. 12...Јc5?!N. The following variation shows the troubles that Black is in for after taking the pawn: 12...Ґxe4 13.¤g3 Ґd5 (13...Ґg6 14.Јf3 ¦a7 15.f5) 14.f5 ўd8 15.fxe6 fxe6 16.Јxd5 exd5 17.¤e6+ ўd7 18.¤xc7 ўxc7 19.¦xd5±. Denis Khismatullin makes a new move, but it seems no better than previously employed 12...Јc8 and 12...ўe7. 13.e5!13.f5 ўe7 is more acceptable for Black. 13...Ґc8. One wouldn't want to play this way, but what else is there to suggest? The e6-pawn is under attack, and on 13...Ґd5 there is 14.f5! 14...f5. If 14...d5, то 15.f5. 15.¤gxf5? This mistake due to some miscalculation turns the tables completely. Meanwhile primitive 15.exd6 Ґxd6 (15...Јxd6 16.Јf3 Јc7 17.¤h5 Ґc5 18.Ґc4) 16.Јh6 raises unsolvable problems before Black, for example: 16...¦g8 17.¤dxf5ќor 16...Ґe7 17.¤h5ќ. 15...exf5 16.e6 Ґxe6 17.¤xe6 Јe3+.This intermediate check is not only a salvation; it allows to obtain a material advantage that is enough for a win. 18.ўb1 Јxe6 19.Ґb5+.This attempt does not help already. 19...ўd8 20.¦he1 Јf6 21.Јf3? !Only 21.Ґa4 Ґg7 22.Јg5 Јxg5 23.fxg5 leaves some chances to keep on fighting. 21...¦a7. Weaker is 21...Ґg7?! because of 22.¦e5 ¦a7 23.¦xd6+ Јxd6 24.¦d5. 22.Јf2 ¦b7. Also wins 22...Ґg7 23.¦e5 (23.c3 bxc3 24.Јxa7 c2+ 25.ўxc2 Јxb2+ 26.ўd3 Јxb5+ 27.ўe3 ¦e8+) 23...¦b7 24.Јc5 axb5 25.¦xd6+ ¤d7 26.Јxb4 Јxd6 27.Јxd6 Ґxe5, but Denis chooses a simpler way. 23.Ґa4 (23.¦e8+ ўc7 24.¦xb8 ¦xb8 25.Јa7+ ¦b7 26.Јxa6 Ґg7°) 23...Ґg7. White position is absolutely hopeless. Some more moves were played through inertia. It may probably appear to someone that Denis had all the luck. I can agree with it only in part: the smile of fortune has to be earned. The following outwardly unremarkable episode conceals deep penetration into the secrets of position. 26...Јc5!First thought is: nothing can be simpler, just exchange queens and there is no attack! The second one (and it's good for you if you have time for this second thought): can't I be missing 27.¦xf7?, and, at last, the third (and correct) one: the subtle variation 27.¦xf7? ¦xf7 28.Јxc5 ¦df8!° – an excellent trap that allows to come to a positionally competent decision. 27.h3. 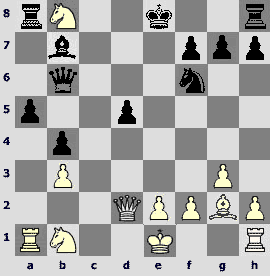 The threat 28.¦xf7 is in force again, but Black's tactical tricks never cease. 27...¤f5!The rook on f6 is in danger. 28.Јxc5. It is possible to sacrifice an exchange by way of 28.exf5 Јxf2+ 29.ўxf2 ўg7 30.¦xe6 fxe6 31.Ґxe6 or 28.¦xe6 Јxf2+ 29.ўxf2 fxe6 30.Ґxe6+ ўg7 31.exf5. Both branches lead to the same position. An accurate move 31...Ґc8! indicates that White has no reasons to play for a win. 28...dxc5 29.¦xd8 ¦xd8 30.Ґxe6. And now 30.exf5? ўg7 is clearly favorable for Black. 30...fxe6 31.exf5 exf5. It is not worth its while to leave the passed e-pawn to the opponent: 31...¦d2?! 32.fxe6 ¦xg2+ 33.ўf1 ¦g6 34.¦f5 ¦xe6 35.¦xc5. And now for the promised drawn themes. It's nice to watch the GMs' struggle: the game goes on till bare kings in complete accordance with Sofia rules, both opponents are worth each other. 18...b5!? In this variation the "who's faster?" debates are being held for a long time. 19.¤xb5 Јb8 20.hxg6 hxg6 21.¤c3 ¦b4 22.¦h4. 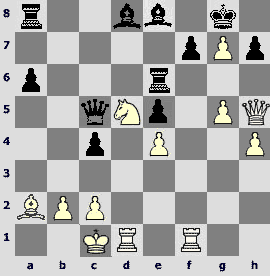 White's intention is to position his major pieces along the last file and simply to give mate. Black has to take care of the counterplay on the opposite flank. 22...Ґxb3 23.cxb3 ¦xb3 24.¤b5 ¦b4 25.Јc2 Јb7!N. 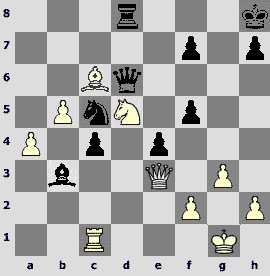 InMadl – Medved, Hungary 1998, Black played 25...d5?! and was successful, but one shouldn't draw any far-reaching conclusions out of this fact. Dmitry Chuprov plays in a more logical way, making his "sleeping" rook enter the game. 27...¦xb5! After 27...¦xa4 Pavel Smirnov would have executed the sentence by way of 28.Ґxf6! (28.¦h1 ¤h5!) 28...Ґxf6 29.¦h1. The only way to avoid an immediate defeat for Black is 29... ¦c1+! 30.¦xc1 ¦b4 31.¤c3 Ґxh4 32.¤d5!± (but not 32.Јxh4? ¦xb2+ 33.ўa1 Јb3!°). Now 32...¦b3? 33.Јxh4 ¦xb2+ 34.ўa1ќ is bad, so the exchange has to be returned. 28.axb5 Јxb5 29.¦h1?! 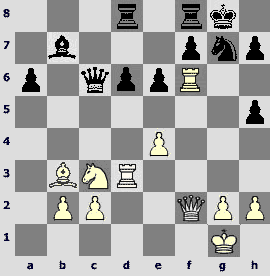 A straightforward attempt that is sufficient only for a draw, provided Black defense is accurate and unobvious. Meanwhile after 29.Јd2 with an idea of g4-g5 White's chances would still be better. There's nothing for it - the variation chosen by Black is objectively extremely risky. 29...Јd3+ 30.ўa2. After 30.ўa1?! ¤h5! 31.Ґxg7 ¦c4 32.b3 ¦c2 only Black can play for a win. 30...¤h5! That'sit, then! Due to this resource Black wins some tempi and manages to hold the position. 31.Ґxg7 ўxg7. Bad is 31...¦c4? 32.Ґc3! or 31...¦c2? 32.Јxc2 Јxc2 33.Ґc3. 32.¦xh5. In Black's favor is 32.gxh5? ¦c2 33.Јg1 Јc4+ 34.ўb1 Јb3, and if 32.Јg1, then the salvation is 32...Јc4+! (32...¦c2? 33.¦4h2) 33.b3 Јc2+ 34.ўa3 a4! 35.Јd4+ e5 36.Јxa4 Јc5+= with perpetual check. 32...gxh5 33.Јxh5 Јc4+ 34.b3 Јc2+ 35.ўa3 Јc5+. 35...f6= does not change anything– White has nothing better that a perpetual check at his disposal. 36.Јxc5 ¦xc5. The storm has passed over. There is a drawn rook ending on the chessboard, and still Pavel keeps searching for an opportunity to struggle on. 42.f4!? Refusing the banal move repetition. 42...¦e3 43.¦b1 ¦xe4+ 44.ўxa5 ¦xf4 45.b4 ¦xg4 46.b5 ўf6 47.b6 ¦g8 48.ўa6. Playing with fire, but not over stepping the limits. In case of 48.b7 Black draws by way of 48...¦b8! 49.ўb6 ¦xb7+ 50.ўxb7 ўe5! 51.ўc6 f5 52.¦e1+ ўd4! 53.¦xe7 f4=. 48...ўe5 49.ўb7.A continuation of a somewhat peculiar idea. 49...f5 50.¦e1+ ўd4.Black has no reasons to play for a win as well. For example, to a draw leads 50...ўf6 51.ўc6 f4 52.b7 ¦b8 53.ўc7 ¦xb7+ 54.ўxb7 f3 55.ўc6 ўf5=. In the double-edged position with bishops of opposite colors Ian Nepomniachtchi, true to his style, gives up a pawn for the sake of opening up the g-file. 29...g3! ?A serious alternative is 29...Јxd3 30.¤g3 ¦h8, trying to benefit from his position while having a material advantage. 30.¤xg3. Bad is 30.¦f3? because of 30...Јb2 31.¦e1 Јd2 32.ўf1, and here the issue is decided by 32...¤xe5! 33.¦xg3 (or 33.Ґxe5 Ґxf3 34.gxf3 Јe3!) 33...¤g4°. 30...¦g4!A competent decision. After the trap 30...Јxd3!? (reckoning on 31.¦f3? Јc2 32.h6 ¤e7! 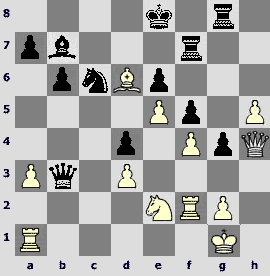 33.¦f2 Јc3° with a win of a piece) White has in stock an attractive move 31.h6!, and Black faces troubles: 31...Јxg3 32.h7! or 31...¦g4 32.Јh5! with a threat 33.h7. 31.Јh3 Јxd3 32.¦f3 Јd2. More precise is 32...Јc2!, and after 33.h6 ¤xe5! (bad is 33...¦h7? 34.¤h5 ¦xh6 35.¦f2!ќ) 34.Ґxe5 Ґxf3 35.gxf3 ¦g6 an irrational position ensues in which each party has its own bargaining chips. 33...¦xg2+!Also possible is 33...Јb2 34.¦e1 ¤xe5! (in White's favor is 34...d3?! 35.¦f2 Јd4 36.¤f6+ ¦xf6 37.exf6±) 35.¦f2! 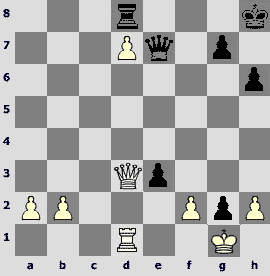 Јb5 36.Ґxe5 Ґxe4 37.h6 ¦h7 38.Ґxd4 – the position is unclear, but black king feels less comfortable. Sacrifice employed by Ian is more attractive from the human point of view. 34.Јxg2 Јxg2+ 35.ўxg2 fxe4 36.¦g3. What will prevail – the extra exchange and the passed h-pawn or two connected passed pawns in the center supported by the active minor pieces? It is not easy to give a correct answer. 36...e3! In case of 36...d3? there is a very unpleasant reply 37.h6! ¤d4 38.¦g8+ ўd7 39.¦c1 with the threats 40.¦c7+ and 40.¦g7. 37.ўg1. Another interesting possibility is 37.ўh3!? Ivan Popov is concerned about black passed pawn and keeps his king near. 37...¦h7!? 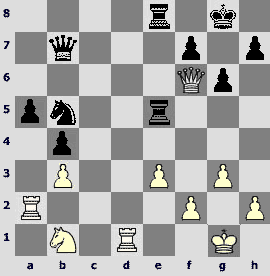 After 37...d3 38.¦xe3 ¤d4 39.¦xd3 ¦xf4 Black activates his pieces to the limit and should make a draw. Ian chooses a more ambitious continuation. 38.¦g8+ ўf7. 38...ўd7? 39.h6!ќ would be a mistake. 40...d3! The only move. Loses 40...exf5? 41.e6 ¦xh5 42.¦f7+ ўg6 43.¦xb7 d3 44.e7 ¦h8 45.Ґf4ќ. 41.fxe6! ¦xh5. 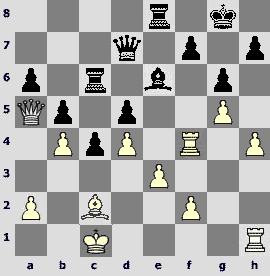 41...d2 leads to a draw immediately, as White has nothing better than a perpetual check: 42.¦f7+ ўg8 (42...ўh6? 43.Ґf8+) 43.¦f8+=. 42.¦f7+ ўg6 43.¦xb7 d2 44.¦f7! ?Simpler is 44.e7 ¤xe7 45.Ґb4 ¦xe5 46.Ґxd2 exd2 47.ўf2=. 44...¦f5. On 44...e2 the most accurate answer is 45.¦f6+! 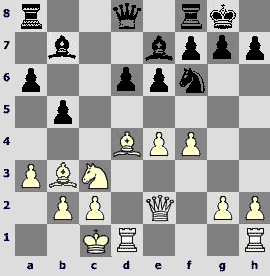 ўg5 46.¦ff1 exf1Ј+ 47.¦xf1 ¦h6 48.ўf2 ¦xe6 49.ўe3 ¤xe5 50.Ґxe5 ¦xe5+ 51.ўxd2= with a drawn rook endgame. 45.¦xf5! That'scorrect! Trying to draw without a pawn after 45.¦d7 e2 46.Ґb4 e1Ј+ 47.¦xe1 dxe1Ј+ 48.Ґxe1 ¦xe5 49.Ґc3 ¦xe6 is a thankless task. And now after a short tactical skirmish the position becomes completely level. 45...ўxf5 46.e7!Loses 46.ўf1? ўe4° – black king gives a helping hand to the connected pawns. 46...e2. On 46...¤xe7 there is 47.ўf1 ¤d5 48.Ґb4!, but now we have a picturesque and unusual position! 47.e8Ј e1Ј+ 48.ўg2 Јxa1 49.Јh5+ ўe4 50.Јe2+ ўd5 51.Јxd2+ ¤d4! ?Ian looks for a chance to win in any situation! But his opponent is accurate. 52.Јd3 Јc1 53.ўf2 b5 (53...Јc2+ 54.Јxc2 ¤xc2 55.Ґb8 a6 56.a4=) 54.e6!The simplest way. 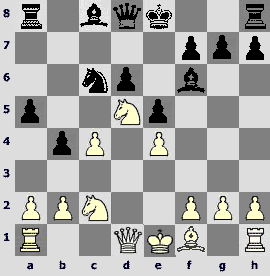 In is not difficult at all to calculate the variation and to evaluate the ensuing endgame precisely. First rounds added some examples on "miraculous salvation by perpetual check" to the coaches' files. Let's study them in order of ascending complication. Firstly there is a lost chance. 33...e2?After 33...exf2+ 34.ўxf2 it is necessary to find 34...¦xd7! 35.Јxd7 g1Ј+! 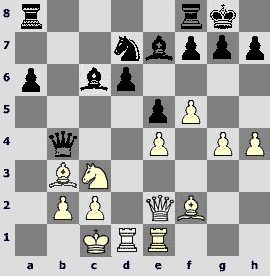 36.ўxg1 Јe3+, and white king cannot hide from checks: 37.ўg2 Јe2+ 38.ўg3 Јe3+ 39.ўg4 Јe4+ 40.ўh5 Јe5+=. In the following fragment it is already Black who has taken advantage of an unexpectedly given chance. 48.Јxc6+? Pavel surprisingly misses 48.Јa5!, which would have finished the game on the spot. 48...ўxc6 49.cxb6 ўb7. 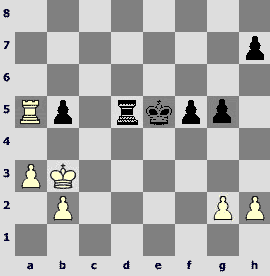 In the rook ending Black holds his position with the only moves. 50.g5 e5 51.¦d1 e4 52.ўb2. 52.g6 fxg6 53.f7 g5 would have led to similar consequences. 52...¦c2+ 53.ўb1 ¦c8 54.g6 fxg6 55.f7 g5 56.¦d2 g4 57.¦f2. Or 57.¦h2 e3! 58.h8Ј ¦xh8 59.¦xh8 e2 60.f8Ј e1Ј+=. 57...e3! 58.f8Ј ¦xf8 59.¦xf8 e2. A perpetual check is unavoidable. I'd like to conclude the first part of my survey with a one-hundred-moves-long thriller by Alexey Kornev and Konstantin Landa. As for now this is a number one in the nomination "the most fascinating game of the tournament". Mutual mistakes do not prevent us from enjoying the full-blooded struggle from the opening till the endgame at all. 1.d4 ¤f6 2.c4 e6 3.g3 d5 4.¤f3 dxc4 5.Ґg2 Ґb4+ 6.Ґd2 a5 7.Јc2 Ґxd2+ 8.Јxd2 c6!? 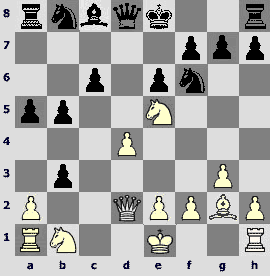 Following in the steps of the first game in Kramnik-Topalov match, Elista 2006. 9.¤e5N. Previously there exclusively occurred 9.a4 b5 10.axb5 axb5 11.Јg5, winning back a pawn. 11.¤xc6?! Future complications turn out to be favorable for Black. Perhaps, it's been worth it to confine himself to 11.axb3 calculating on a positional compensation. 11...Јb6. Worth attention is 11...Јc7!? 12.¤xb8 (12.¤e7? Ґb7 is already not topical here) 12...Ґb7. 12.¤xb8. Much more principled is 12.¤e7! Now on 12...Ґb7 there is a daring 13.¤c8! Ґxc8 14.Ґxa8. It is not easy to evaluate the position in this variation, as well as after 12...ўxe7 13.Ґxa8. Black undoubtedly has compensation for sacrificed exchange. 12...Ґb7! Konstantin overtakes the initiative. 13.d5!? White has no other choice. 13.Ґxb7 Јxb7 14.O-O bxa2 15.¦xa2 b4µ looks utterly sad. 13...exd5. Materialistic 13...bxa2 also looks quite nice. 14.axb3 b4.Stronger is 14...O-O!, in order after 15.¤d7 ¤xd7 16.Ґxd5 to play 16...¤c5! with significant advantage. After the move in the game White gets time to consolidate. 15.¤d7! The only reasonable move. 15...¤xd7 16.Ґxd5 O-O 17.Ґxb7 Јxb7 18.O-O ¤c5. Black advantage is still tangible – his pieces are more active, and there is a possibility to create a passed pawn on the Q-side. 19.Јc2 ¤e4 20.¤d2 ¤c3 21.¤b1 ¤e4 22.¤d2 ¤c3 23.¤b1 ¤b5! A correct idea. 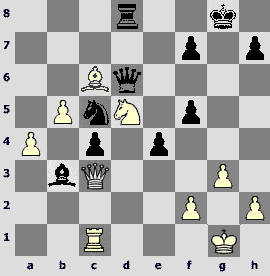 Black has to fortify the position, and the knights are still worth retaining. 24.¦d1 g6 25.¦a2 ¦fc8 26.Јd3 ¦a6! 27.Јe3 ¦e6?! White's last actions had not been very convincing, and here it was Black's opportunity to exchange knights: he obtains a strong passed c3-pawn, and the b3-pawn becomes very vulnerable. After 27...¤c3! 28.¤xc3 bxc3 29.Јd3 (29.¦b1 c2 30.¦c1 ¦d6 31.¦aa1 ¦cd8 32.Јf3 ¦d1+ 33.ўg2 Јb5) 29...Јxb3 30.¦da1 Јe6! Black has every chance to win. 28.Јg5. 28.Јf3!? looks more solid. 28...¦ce8. 28...¤c3!? 29.¤xc3 bxc3 looks actual again, although its consequences are not as clear as before. Further possibilities are: 30.Јxa5 c2 31.¦c1 ¦xe2; 30.¦d8+ ¦e8 31.¦xe8+ ¦xe8 32.Јc1 ¦d8! (weaker is 32...Јxb3 33.¦a3 Јb2 34.Јxc3 Јxc3 35.¦xc3 ¦xe2 36.¦c8+ ўg7 37.¦a8 ¦a2 38.h4! 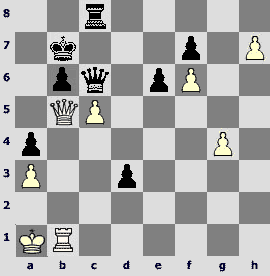 – it is evident that Black has made a bad bargain of it) 33.¦xa5 Јxb3 34.ўg2 ¦c8; 30.¦xa5 c2 31.¦d8+ ўg7 32.¦xc8 ¦xe2! – Black can count on a success everywhere, but I wouldn't permit myself to maintain that his position is won. 30...¤c3! And here is the long-awaited knight's leap. Konstantin chooses an artful version in which White has time to win back the c3-pawn but gets pinned up and will have to give up his two rooks for the queen. 31.¤xc3 bxc3 32.¦c2 Јxb3 33.¦dc1 ¦c5 34.¦xc3 Јb2! A premeditated resource. 35.Јd4 Јxc1+ 36.¦xc1 ¦xc1+ 37.ўg2 ¦ec8. The position is defined. Black hope is the passed a-pawn, and White has to look for counterplay by loosening the black king's residence. 38.Јa7 ¦1c5 39.h3 h5 40.Јa6 ¦8c6 41.Јa8+ ўg7 42.Јa7 ¦c8 43.Јa6 ¦8c6 44.Јa7 ¦c7 45.Јa6 ўh7 46.Јa8 ¦d7 47.g4 h4! Avoiding the pawn exchanges and realizing that the win of the rook pawn means loss of time – the passed a-pawn will run away too far. 48.Јe8 ¦cc7 49.Јe4 ¦d2 50.Јf4 ¦a7 51.e4 (51.g5? a4 52.Јxh4+ ўg7 53.Јb4 ¦d5!°) 51...¦dd7 52.Јe3 a4 53.Јa3 ¦db7. Also interesting is 53...f6! ?, preventing e4-e5 that creates motifs for a perpetual check. 54.e5 ¦b3 55.Јc5 ¦bb7 56.Јa3 ¦b5 57.Јe3 ¦ba5? !A natural-looking move that nevertheless could have led to a draw. Black should have played 57...¦e7. In case of 58.Јa3?! ¦bxe5 59.Јxa4 g5 White is in for a trouble – let us, for example, recall the first game of the Kramnik-Leko match, Brissago 2004. Stronger is 58.Јg5! 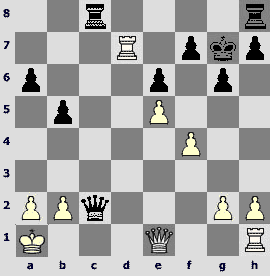 ¦bxe5 59.Јxh4+ ўg7µ – the play for two results continues. 58.Јg5 ¦7a6. 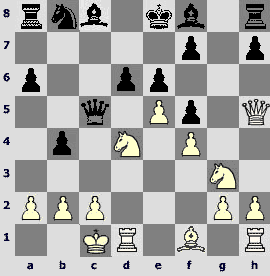 58...¦5a6 59.Јxh4+ ўg8 (59...ўg7 60.f4 a3 61.f5) 60.Јd8+ ўg7 61.f4! a3 62.f5= does not promise anything. 59.Јxh4+?! Here the salvation is a subtle 59.Јd8! (clinging to the a5-rook) 59...a3 (59...¦xe5 60.Јc7!)60.e6! ¦a8 61.Јxh4+ ўg7 62.g5! fxe6 63.Јh6+ ўf7 64.Јh7+=. 59...ўg7 60.Јd8? And here one could set his hopes only on a computer 60.Јg3! a3 61.e6! The move in the game must have certainly led to defeat. 60...a3 61.e6 ¦a8! The fallibility of the Black's 60th move becomes clear. 62.Јd4+(62.Јd7 ¦5a7 63.Јd4+ ўh7°) 62...ўh7 63.Јf6 ¦5a7. The tempting 63...a2?! 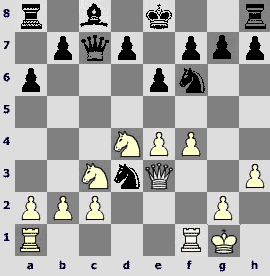 64.Јxf7+ ўh6 65.Јf4+ ¦g5 66.h4 a1Ј 67.Јxg5+ ўh7 68.h5 leads to an unusual position in which there is possibly no win. Thus, after 68...Јg7 69.Јxg6+ Јxg6 70.hxg6+ ўxg6 71.f4 ўf6 72.f5 there is a theoretical draw. 69.Јa2. After 69.g5 a2 70.Јh4+ ўg8 71.Јc4+ there is a fine win: 71...¦e6! 72.Јxe6+ ўh7°. 69...¦a4. Not a necessary move. 69...¦b6! decides the issue more rapidly. 70.ўg3 ¦b4 71.h4.On 71.g5 there follows the intermediate 71...¦b3+! (71...¦b2? 72.Јc4 a2 73.Јh4+=) 72.ўg2 (72.f3 ¦e3! 73.ўf2 ¦d3!) 72...¦b2 73.Јc4 ¦xf2+! (decoying the king to the check) 74.ўxf2 a2 75.Јh4+ ўg8 76.Јc4+ ¦f7+!°. 72.Јe6 a2 73.h5 a1Ј? Permitting a problem-like perpetual check. Black has not missed the win yet, but the path to it is already thorny: 73...¦b3+! (opening the long diagonal for the newly appeared queen) 74.ўg2 (74.Јxb3 a1Ј 75.hxg6+ ўg7) 74...a1Ј 75.Јxg6+ ўh8. 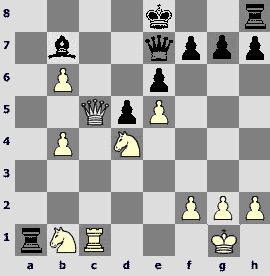 It is evident that White has no perpetual check, but he can take the b3-rook. This position should be won for Black. 74.Јxg6+.Black king has nowhere to hide from checks. White uses the method of corresponding squares. The main thing is to prevent the king from getting to a8, a2 and b1, and also to keep the rooks from blocking the checks. The key square pairs for the king and the queen are as follows: b8-f8, b7-f3, a6-f6, a5-e5, a4-d4, b3-e3, c1-h1, c2-e4. 79.Јd5+? In the end of this fascinating duel civilities were exchanged. Instead of the correct 79.Јf5+! Alexey Kornev makes the losing move. 79...ўc8 80.Јg8+ ўc7?But Konstantin also fails to take into account 80...ўb7! 81.Јg7+ (81.Јd5+ ўa6!°) 81...ўa8!°. 81.Јf7+ ўb8. Everything falls back into place in the end – the draw is inevitable.